(Above: sorry, it's laugh and cry Monday). Sometimes it's hard to know where to turn on a Monday, as weekends always seem to produce an abundance of low hanging fruit. There's the spectacle of Mal Brough vigorously defending himself after his foolish fiddling about with Slipper staffer James Ashby. 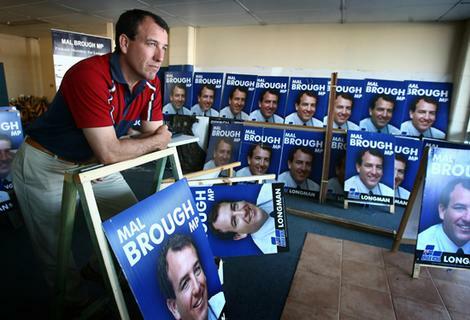 (Brough, government go toe to toe over Peter Slipper affair). The trouble with the vigorous defence is that Brough is a proven liar in the matter - yes, you can call someone a liar in the public domain if it's true and in the public interest, and Brough originally led with a huge porkie when he denied having anything to do with Ashby ... calling such claims "nonsense" a number of times ... only for it to be revealed that he'd met with Ashby three times prior to the launching of Ashby's claim against Slipper. At best, this intervention was unseemly and unwise, and the lie a disturbing cherry on top; and at worst, it is open to more sinister interpretations. Either way, the more Brough huffs and puffs, the more he reminds the world he was the man responsible for the spectacularly unsuccessful invasion of the Northern Territory. Why do politicians think they can lie, then change their minds? Do they think no-one will remember the original "nonsense" and will accept a brand-new alternative "nonsense"? Meanwhile, there's been much heart-wringing and perturbation about the implications of Gina Rinehart getting a seat or two on the board of Fairfax, as if somehow Fairfax is currently a liberal bastion of the democracy. Truth to tell, both Fairfax and the ABC project a soft right wing veneer, which only seems respectable put up against the extreme right-wing lunacy that's befallen The Australian, the Daily Terror and the HUN. These days news is free, and it will stay free because there are too many ways to obtain news for it to be contained and priced by old-fashioned tree-killing delivery systems. So it's the opinion and informed information out of the free norm that is supposed to justify an ability to price - if you want to know more about how to make a squillion, keep up to date with the AFR, if you want to know more about the world, including say education, read the opinion leaders in the SMH and The Age (and never mind the hapless souls trapped in one newspaper towns like Adelaide). Pay for opinion in Fairfax? So how is it that week after week we get nonsense scribbled by the likes of Paul Sheehan, and yes, this week his theme is education in Numbers all add up for hero schools. Back when NAPLAN started, it was predicted that stupid people, and in particular the more stupid members of the commentariat in search of a weekly column, would seize on NAPLAN numbers to reach really dumb and stupid conclusions about educational matters. I am appalled and shocked, too, that this motion refers to the 'knowledge economy'. We all know that NAPLAN is a farce—it is not a sensible way to measure your children's increasing knowledge across the nation—but we already have NAPLAN indicating that there is a substantial drop in literacy, numeracy and people being able to interpret literature. We are failing in the OECD league tables when we are compared with some of our Asian developed neighbours in terms of our kids being able to understand and compete well in maths, science and overall literacy and numeracy. This government stands condemned for what it has done. (here). Overall, good religious schools deliver the highest economic pay-off in delivering above-average performance. Indeed. Especially the ones devoted to teaching creationism and scientology and Islamic fundamentalism. Never mind, the analysis of data delivered by Sheehan to reach this exceptional conclusion is a hoot, involving peculiarities of weighting and what we might call Sheehan statistical shoe-horning, and is a delight to behold. If only we had the time to marvel at it, and contemplate it at length. But when confronted with this level of sophistry and rambling, the pond always likes to present some alternative readings, and happily a recent article by Diane Ravitch in the New York Review of Books, Do Our Public Schools Threaten National Security? comes to mind (currently outside the paywall). The one consoling feature of the Australian education scene is that it isn't as comprehensively stuffed as the bizarre scene in the United States, though that's balanced by the disturbing notion that the United States has Ravitch, and Australia has the likes of Paul Sheehan and Kevin Donnelly. Unfortunately, instead of looking to Finland (or Singapore or South Korea) - all of which invested in strong public education systems - NAPLAN proponents looked to the United States, its charter schools, its vouchers and its national testing (not to mention bizarre yadda yadda about education in the service of national security). 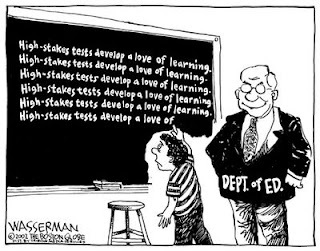 In pursuing its policy of Race to the Top, the Obama administration has promoted the teach-to-the-test demands of NCLB. Most of America’s teachers will now be evaluated by their students’ scores on those annual multiple-choice tests. Students will, in effect, be empowered to fire their teachers by withholding effort or will bear responsibility if their lack of effort, their home circumstances, or their ill health on testing day should cause their teacher to lose her job. NCLB and Race to the Top have imposed on American education a dreary and punitive testing regime that would gladden the hearts of a Gradgrind but demoralizes the great majority of teachers, who would prefer the autonomy to challenge their students to think critically and creatively. This dull testing regime crushes the ingenuity, wit, playfulness, and imagination that our students and our society most urgently need to spur new inventions and new thinking in the future. By golly, did you ever come across such a variety of adjectives to deploy against the dreary, punitive, Gradgrinian, demoralising, soul-crushing Sheehan with his yadda yadda about the joys of a religious education, based on his reading of the NAPLAN entrails. He's such a goose, he doesn't even understand the contradictions in his thinking. There he is blathering how NAPLAN bolsters the push to give greater autonomy for headmasters (yes, yes, he can't imagine headmistresses) at state schools, when of course such greater autonomy is meaningless when faced by the need to conform to the requirements of NAPLAN testing. (Below: some testing jokes, apply to NAPLAN as you will). The best laugh from Sheehan's column was his assertion that Moriah College, Queens Park is in a "modest, low socio-economic area". I've heard that some of the parents there can't even afford a nanny! Steady Joe, according to some rubbery figures, the average household income in Queens Park is a humble $1756 a week. That's only 91k a year, that's struggle street. True, that's up against the average for the rest of Australia of $1,027, but when you take out a cup of coffee a day, and private school fees, why it's struggle street. Anyway, that's for 2006 and it's been downhill all the way since then. As for the school itself, all it's got by way of facilities is a synagogue, an auditorium, tennis courts, a gym, a cafeteria, a learning centre, a swimming pool, a couple of libraries, an assembly hall, an amphitheatre, basketball courts, computer labs, a performing arts centre, and an assortment of school, college, science, Jewish studies, arts, design & technology buildings, not to forget a music centre, and a "state-of-the-art" preschool. NAPLAN enforces a sterile view of the curriculum that undermines the rich education represented by music, literature and the arts. DP, we've been on the Newell, so a bit late to this. Did you notice the editorial in The Heart Of The Nation extolling the virtues of good teachers? There I was, one minute thinking "Yeah!" for all schools, then, in an instant, wondering how the voucher-safers @ TheOz could get from there to Kevin Donnelly in less than three moves. Well, there's the evidence in yer blog. (5) the thought of Donnelly & the IPA is the way to go, like, Vouchers. All done & dusted within a week of nodding agreement by the Grey Horde. If only they could digitise that for next year's voters. "I wouldn't be quite sure what I saw and what I didn't see. But whatever I've said at different stages, I've said with complete truth"
Welcome to the pond Kevin, but sad to say your support of private school funding at the expense of a secular system grieves the pond. The reverend Shirley Maddox, a former NSW moderator of the Uniting Church, met Pell before an ecumenical memorial service for the Queen Mother in Sydney in 2002. "I made the usual harmless kind of conversation that I make to elderly gents from other denominations who are a bit surprised to find themselves talking to an ordained woman," Maddox says. "But he couldn't look at me. I got grunts in response." Comments older than two days are moderated and there will be a delay in publishing them. Hurry up. The loons! The loons! They're welcoming us back. Look! Look! Oh, look, I've spotted the loons! Oh! Oh, they're so lovely. 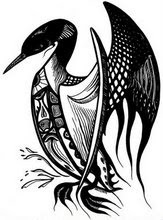 I never saw such big loons in my life. The loons have been calling for rain all night long. Rain! Rain! Bring us the rain! That's what the loons said, huh. It's a dead loon, Norman. The poor thing. Oh, it smells too.